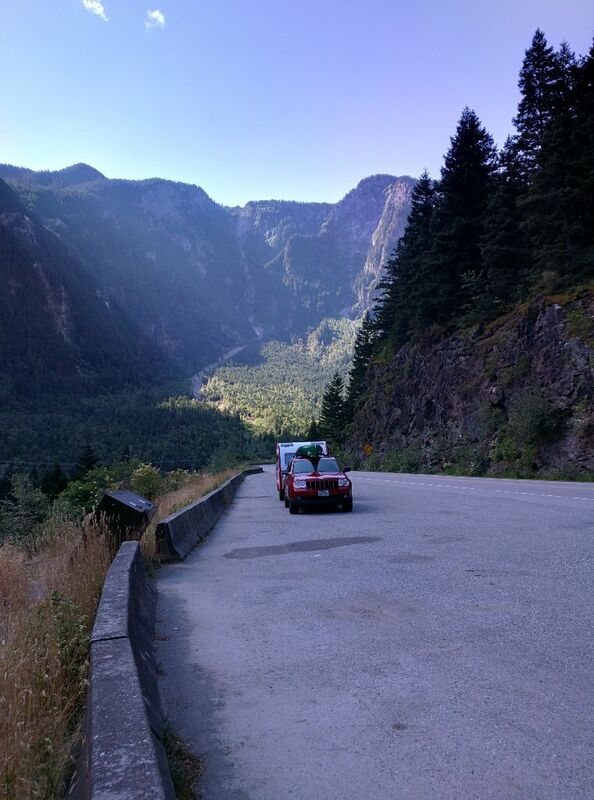 June 20, 2015 – Chilliwack to Prince George today. The Fraser river is deep in its gorge and the road blasted into the wall. The window is open and the sound of the dry smooth road beckons me onward. The morning clouds have been replaced by a blue sky and the temperature is warm but not hot. I finally feel like I am on vacation. On the road at 8:30 today, after a good night’s sleep, just after the morning rush. Mid morning a coyote crossed the road on one of the long straight stretches and stood by the side of the road where I could get a good look as I drove by. Great places to stop to look down at the mighty river churning as it is squeezed by the narrow rock walls. I’ve decided that I won’t linger in Canada on the way north, but rather head for Alaska quickly and then work my way south with less haste. At this point I’m of the mind that I’ll spend a lot of time in Alaska and Canada, but I haven’t thought about what is next after that. 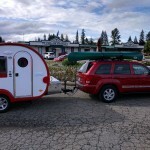 I know that I want to travel and camp and such for most of the fall, the One Long Drive is yet to really take form. One day someone will ask “Where to next?” and I’ll say off hand “I think Key West.” and that will start the ball rolling. The weather and terrain today are actually quite varied. The sky from low overcast in the early morning to bright blue and then broken clouds, to rain, then sleet so heavy that 25 miles per hour was pushing things. The forest went from familiar west side Douglas Fir, over to the east side arid with mixed Pines. Deep in the canyon near Hell’s Gate and Boston Bar the trees are sparse. Back into the forest as we continue north with highway 97 and parallel the mountains. Here at Cache Creek we leave the Trans Canada Highway 1 as it turns east. Now we are in the Cariboo region a plateau between mountain ranges, long rolling hills covered with forest and interspersed with lakes, rivers and meadows. I stopped in Cache Creek to get some fuel. 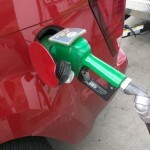 The station’s color scheme was green and yellow, so the handles on all the pumps were green. 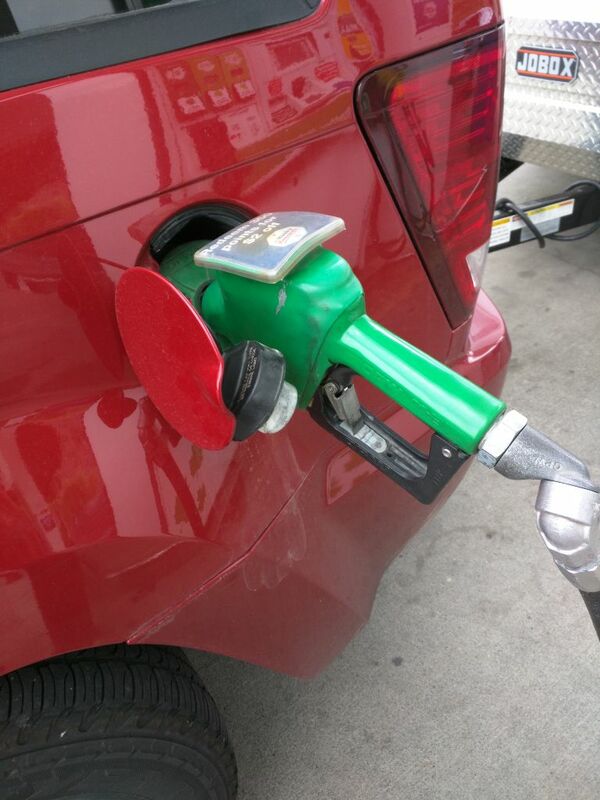 It made me stop and think, in my experience green usually means Diesel everywhere else. Tim Horton’s with free WiFi have been frequent so far, and pretty easy to find, but very hard to park. At the Tim Horton’s in 100 miles house I pretty much made my own pull through spot in this lot where the lines were dim. The need for WiFi was fourfold, updating the blog, backing up photos, planning my route, keeping in touch with events back home. As bandwidth proved harder to find I did less of each of these things. In my road log I’ve written “did a lot of writing today”. I had started out keeping a log and then using this to create blog posts. As time went on the workflow became just keeping bare notes in the log, and most of my stories on the blog. If you got to read those early posts I’m happy, but they were mostly lost to the mysteriously missing database and that compounded by the hosting company’s corrupted backups. I’ve taken steps to avoid this the second time around. The plan for backing up photos worked out, but not the rather weak plan for protecting data from the blog. But then the blog was a sort of a last minute experiment that turned out much better than I had expected. Early in the trip I was not only trying to update the blog, but also upload my pictures to the cloud as a backup strategy. I kept this up until I started south again. The lack of bandwidth on these connections made it impractical. While I was in Anchorage I bought some extra solid state storage and started keeping multiple copies, and keeping these stashed in various places. That really freed up some time, prior to this I spent way too much time sitting around watching the upload progress. Copying files to several chips or sticks is both much faster and much more predictable than pushing bits over a wireless network in competition with any number of other users, in places where bandwidth may be severely limited for the community as a whole anyhow. In Quesnel I stopped to get a picture or two. This was as far as I had been along this road recently. 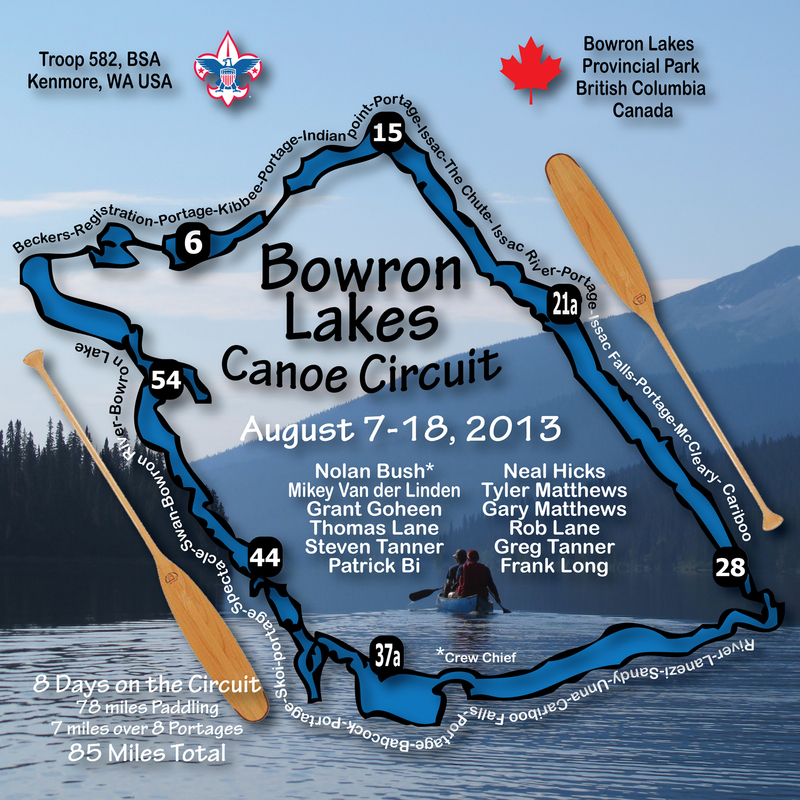 In 2013 I had come this way with some boy scouts, we turned East at Quesnel on our way to paddle the Bowron Lake Canoe Circuit. That canoe trip was 8 days of paddling and portages, 78 miles on the water and 7 miles on land. 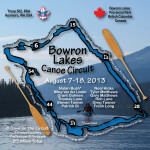 If you canoe, this is a trip of a lifetime, but there’s a lottery so planning is essential. I have included a bunch of photos from Bowron below. Before that I had been this way heading to Prince Rupert in 1979 that time as a boy scout myself. That time we were on a mission to learn more about the native people, their art, song and dance. I will end up visiting one of the key places from that trip on my way back south. I ended my day in Prince George. It is a bigger town, so lots of the bigger chain stores here. I was heading for Costco to get fuel but just missed getting there before the station closed. The next morning I would find out that I couldn’t buy fuel there anyhow. They only take Canadian Debit cards and Master Card at the pump, and I had neither. If I had been set on buying fuel here I probably could have gone inside and bought a gift card, but it was only a small saving over other stations. But Costco was my go-to for fuel in many places on this trip, it doesn’t hurt that you can get a cheap hot dog and there’s usually ample parking. With the emphasis on getting to Alaska sooner, I was on the road most of the day. I wasn’t planning to stay anywhere long, and when I stopped I didn’t even plan to drop the stabilizers let alone unhook from the car. 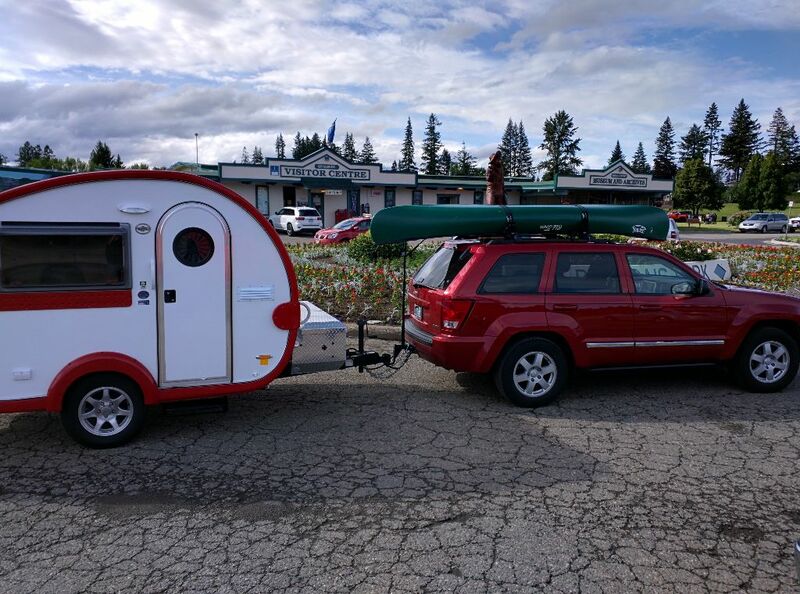 I hate paying for a night at an RV park for seven hours of parking, so taking advantage of anywhere I could just pull over was my plan at this stage. So as much as I don’t like the way they do business I found myself at Walmart often. Even though I was traveling all day, and I didn’t have very good access to look up information about where I was or what there was to see, I really enjoyed this day. I felt like it was actually a vacation, and I slept well. Very nice wide pullout. I could see the train tracks below and got to see a train pass by. Speaking of trains. I guess most long rail routes will be built from both ends and meet somewhere in between. Opportunity for a celebration. No, I am not putting diesel in my Jeep. But I felt like I had to pay really close attention at this gas station. This is a logo that I created for our trip. We made a T-shirt out of a black and white version without the photo behind. It actually took us two days to drive up and two days to drive back from here to do it without pushing too hard. When you are driving someone else’s kids you want to be extra cautious. A shallow arm of one of the lakes. Look at the shadow of the canoe on the lake bottom only a foot below. It was a trick to keep the paddles out of the mud. We did our best to reduce our impact. Much of the shore was steep and rocky like this. So only a few campsites. Around the other side of the circuit. Passing through a shallow river between lakes. Playing in the eddy of one of the few rapids.